The platforms consist of a stable aluminum construction, are TÜV certified, CE-compliant and can be reused for many years. Their modular design enables installation via man-way or other vessel nozzles. The individual modules have a low net weight and are easy to handle: The platform is securely fastened with just a few screws. 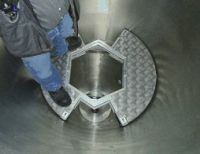 Special rubber pads protect the vessel's wall surface. Upon request, we provide working platforms with rescue hatches and any type of flaps – tailor-made to meet customer requirements. Additional features such as ladders are also provided. Please find here more information about our working platforms.